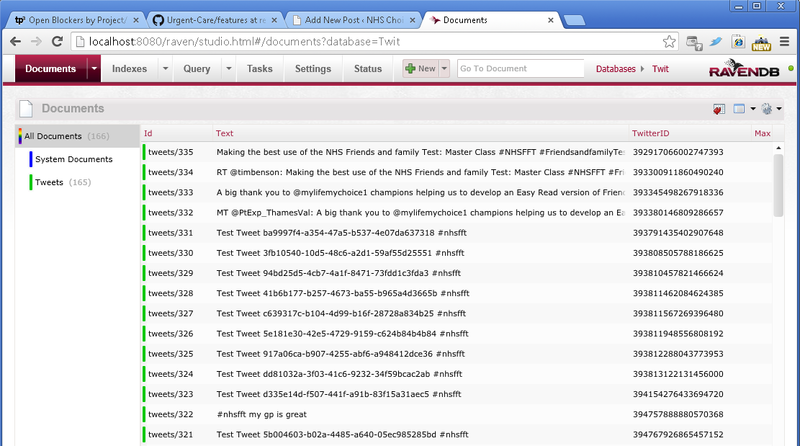 For my 10% time project I have decided to look at whether Friends and Family Ratings could be submitted via Twitter. The idea was that if you’re sat in a GP waiting room you might be tweeting, and if you were shown a particular hashtag(s) then you could use these to tweet a view on the service you’re receiving. However I’m going to explore the possibilities and see where it takes us – there may be mileage in integrating with Care Connect so that people can submit real-time ratings, comments or complaints via Twitter. It could be extended beyond Twitter itself to other channels. We could make use of geo-location (thanks Russell) or QR codes (thanks Sean) to enhance the experience. The next step is to write a separate process, which takes these stored tweets and posts them to Choices via our comment capture API. I’m trying to practice what I preach (!) and use a BDD and TDD approach to the coding, with lots of refactoring as I go to ensure the code-base stays simple and clean. It’s also good for learning – I found that you don’t have to store the NuGet packages in source control (thanks Steve), and am learning bits and pieces about RavenDB too. Interacting with Twitter poses some challenges too. I began writing raw requests, but found dealing with OAuth was eating up time (when I just want to get something working) so am now using a couple of .Net components that wrap around the Twitter API. It’s likely that I’ll have to move from using the REST API to the Streaming API too, in order to ensure we don’t miss any tweets. I’m also learning more about git – it’s only in a local repository at present, but will hopefully be in github soon!